Livingston, Montana is a small ranching community of about 7,000, just north of Yellowstone National Park. Most of the town’s economic activity revolves around agriculture and tourism — being so close to Yellowstone brings in lots of travelers. Bozeman, which is about 30 miles away hosts a growing manufacturing and photonics industry. Despite these opportunities, students at nearby Park High School don’t always interact with industry leaders in the area, limiting their ability to explore different career options and weakening the talent pool for local business owners. Last year Meagan Lannan, then manager at the Livingston, Montana Job Service office, along with several community leaders, decided to step in and ask educators how best to support a new work-based learning program to help close the gap and connect young learners with industry mentors. After studying states like Tennessee, Washington and California for inspiration and strategies, she built a coalition of key partners to launch a work-based learning program and engage more than 260 high school students in their first year. So how did Lannan mobilize her town to go all in on work-based learning? She started by securing buy in and support — including funding — from key business and education leaders in Livingston. After getting commitment from the Montana Department of Labor and Industry, the Montana State University Park County Extension, and Park High School, Lannan established a memorandum of understanding to clarify the roles of each partner. She also secured an agreement from the Arthur Blank Foundation, the charitable organization of Home Depot founder and philanthropist Arthur Blank, for four years of funding for a work-based learning facilitator pilot program. Leveraging the relationships she cultivated at the job service office, Lannan was able to mobilize a network of Livingston business leaders to drive and provide work-based learning opportunities for high school students. It took a lot of time and effort to build and nurture these relationships, but Lannan’s hard work paid off. Once the community recognized the value and critical role in connecting learning with work, business leaders were on board. In total, more than 260 work-based learning experiences were brokered through the first year of the pilot program. Experiences ranged from low-touch engagements such as guest speaking to more intensive internships, apprenticeships and more. Some employers even came into the classroom to teach a few classes under the teacher of record before leading students on a tour of their facilities. While several work-based learning experiences were in industries like agriculture or manufacturing that are considered high-demand in the Livingston area, students had the opportunity explore a variety of different careers. One student learned about wolf tracking in Yellowstone National Park. Another partnered with a local business to learn about sound wave engineering. 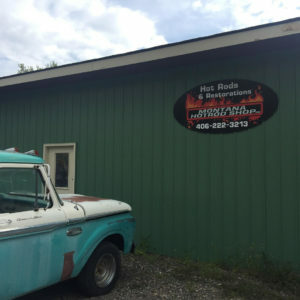 Providing work-based learning opportunities can be a challenge in rural communities, which often have a small employer base and limited industry presence. But, as Livingston, Montana discovered, a successful work-based learning program hinges on the support and buy-in of the community. Rural business leaders are often ready and willing to roll up their sleeves and, as Lannan puts it, help “raise the barn.” It just takes a thoughtful, coordinated strategy to generate buy in, secure sustainable funding and connect learners with the world of work. Ensuring access to high-quality career pathways in rural areas is a persistent challenge facing state and local leaders — but communities like Livingston, Montana defy the odds, recognizing the value of work-based learning and committing to expanding opportunities for students. Thanks to Meagan Lannan, Work-Based Learning Facilitator Lead, for providing input into this story. We are back with another CTE Research Review. In this edition we explore business-facing intermediaries and a new study on reverse transfer students. And below the fold, we feature some studies and stories you may have missed in the last month. 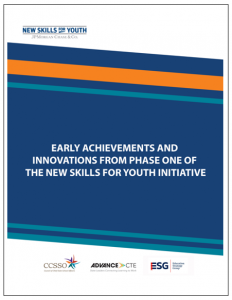 The U.S. Chamber of Commerce Foundation is out with a new report in its Youth Employment Series titled Talent Orchestrators: Scaling Youth Employment through Business-Facing Intermediaries. The report challenges the notion that employer engagement is only a civic or philanthropic venture and outlines how business-facing intermediaries can create shared value by matching businesses with skilled youth. Already, intermediaries around the country are stepping up to the plate by managing employer demand, equipping youth with professional skills and job-specific training, and facilitating the onboarding process to connect youth with employment opportunities. Consider STEP-UP Achieve, a career-track youth employment program started by Minneapolis-based intermediary AchieveMpls. The program partnered with the Minneapolis Regional Chamber to develop a curriculum and establish a certification endorsement for youth participants who successfully complete a pre-employment work-readiness program. This program, and others like it, created shared value by both preparing youth for the workplace and providing employers with a signal of job readiness. STEP-UP Achieve has provided more than 8,000 internship opportunities since 2004. Speaking of alternative pathways to employment, a new research study from the Center for Analysis of Postsecondary Education and Employment (CAPSEE) examines academic and labor outcomes for struggling students who transfer from a four-year to a two-year postsecondary institution (aka â€œ4-2 transfer studentsâ€). The study, Do Students Benefit from Going Backward? The Academic and Labor Market Consequences of Four-to Two-Year College Transfer, finds that struggling 4-2 transfer students are more likely to earn a postsecondary credential than similar students who do not transfer. Whatâ€™s more, these students were no less likely than similar students to earn a bachelorâ€™s degree and had similar earnings and employment rates. The outcomes of the study are promising because they suggest that struggling students can benefit from the flexibility and affordability of transferring to a two-year college without putting degree completion or future employment at risk. The Institute for Higher Education Policy (IHEP) released a series of 11 policy papers about state and federal data policy. The series, Envisioning the National Postsecondary Infrastructure in the 21st Century, highlights recommendations for improving the national postsecondary data infrastructure from a working group of policy experts. Two months after the Lumina Foundation released its April update on college degree attainment, Inside Higher Ed examines how the Foundationâ€™s new method of calculating postsecondary degree attainment, which now factors credential attainment into the total, affects Louisianaâ€™s college completion goal. And if you havenâ€™t already, you should check out The Journal of School & Societyâ€™s special issue on The Future of Vocational Education, which shares voices from educators and academics. Last Tuesday, President Obama released his final budget request to Congress for Fiscal Year (FY) 2017. This document formally kicks off the federal budget and appropriations process for the coming year. As has been the case for much of the Presidentâ€™s time in office, this process is again shaping up to be rather contentious as both parties debate issues of spending and taxation in the context of the looming Presidential and Congressional elections this November. Overall, the Presidentâ€™s budget outlines an extremely ambitious set of spending priorities for the coming year, totaling $4.1 trillion overall. The budget proposes significant new investments in a number of new and existing education and workforce development programs, but disappointingly does not propose any additional funding for states via the Carl D. Perkins Actâ€™s (Perkins) basic state formula grant program. Instead the President has renewed his proposal for the creation of an â€œAmerican Technical Training Fundâ€ (ATFF) that, if created, would constitute a new competitive grant program outside the scope of this foundational support for CTE. ATTF can best be understood as a successor program to the Admisntrationâ€™s 2013 Youth Career Connect Initiative, but so far Congress has not acted to formalize this proposal which was also included in the Presidentâ€™s budget last year for $100 million at that time. As Kimberly Green, Advance CTE Executive Director and others noted on the day of the release, the Presidentâ€™s request for level-funding for Perkins state grants is concerning at a time when demand for high-quality Career Technical Education (CTE) programs is risingâ€” a fact even the Administration has recently highlighted. While the Obama Administration does request an additional $2 million for CTE national activities under Perkins, this increase would also be used for the purposes of evaluating the effectiveness of the proposed ATTF. $500 million in mandatory funding for the creation of a â€œWorkforce Data Science and Innovation Fundâ€ along with a doubling of funding for state longitudinal data systems. Read more on these data investments at the Workforce Data Quality Campaignâ€™s blog. $2 billion to expand apprenticeship programs, and $200 million specifically for youth apprenticeship and pre-apprenticeship programs. Increases for the Workforce Innovation and Opportunity Actâ€™s youth, adult, and dislocated formula grant programs that are each consistent with the funding levels proposed in the law. $60.8 billion in mandatory funding for the Presidentâ€™s proposed â€œAmericaâ€™s College Promiseâ€ program that would provide two years of postsecondary education tuition-free for eligible students in qualifying programs. $500 million for business tax credits (up to $5,000 each) for employers to partner with community colleges in high-demand industry areas and incentivize the hiring of graduates. The grants would be available from 2017-2021 and more information can be found here and here. The Presidentâ€™s budget can be viewed in its entirety here. The U.S. Department of Labor and Educationâ€™s (USDOL / USDE) budgets can be accessed here and here respectively. Of particular note is USDEâ€™s budget justification for CTE and Adult Education which can be accessed here. This document provides further insight into the administrationâ€™s thinking behind their Perkins proposals contained in the budget and outlined above. It is important to note that this budget request is simply thatâ€” it does not constitute formal policy and Congress must still pass a budget and respective spending bills to enact any of these proposals. Given Congressional Republicanâ€™s continued concerns on federal spending, deficits, and the national debt, there is little chance that most of what is being proposed by the President will become law. In fact, the Congressional budget committees have gone so far as to â€œsnubâ€ the administration and have not asked the Director of the Office of Management and Budget to testify on this proposalâ€”a key indicator on how far this proposal is likely to get in Congress this year. 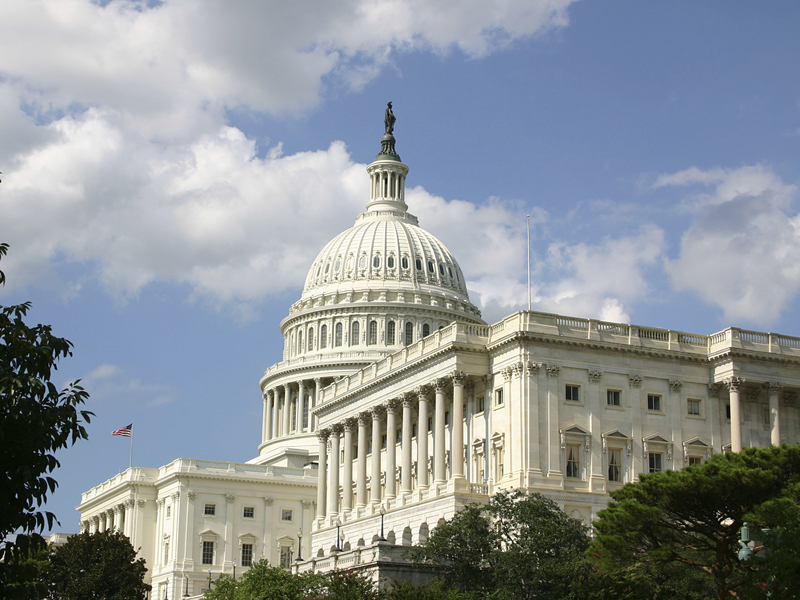 As the Congressional budget and appropriations process continues to take shape, be sure to check back here for more updates and analysis. As many areÂ aware, every year February is informally known as â€œCTE Monthâ€â€”a time to celebrate and lift up all of the great work underway in the CTE community. Last week, the Senate voted unanimously in support of a resolutionâ€”sponsored by Senate CTE Caucus co-chairs Sens. Kaine (D-VA), Portman (R-OH), Baldwin (D-WI), and Isakson (R-GA)â€” that formally recognizes and honors February as CTE month. The resolution can be viewed in its entirety here. The resolution was co-sponsored by 17 other Senators from both parties and the Senateâ€™s unanimous recognition and support of this resolution underscores the chamberâ€™s continued commitment to the CTE enterprise. Advance CTE applauds this move by the Senate and looks forward to celebrating the rest of CTE month in the coming days and weeks. In addition to this effort, the Senate CTE Caucus also played host to a briefing on employer engagement with CTE programs last week. The briefing, co-hosted by the Industry Workforce Needs Coalition and Opportunity America, gave employersâ€”ranging in size and location from a small manufacturing firm in Wisconsin to a large engineering firm in Texasâ€” a chance to speak about the importance of CTE to their respective enterprises and industries. Each of the panelists emphasized the importance of employers having a â€œseat at the tableâ€ during program development and implementation and underscored that there are many ways for employers of all shapes and sizes to engage with statesâ€™ CTE systems and with local CTE programs. Three of the four Senate CTE Caucus co-chairs provided remarks during this event, each speaking about their unique interests in CTE and how they view CTE meeting the needs of students and employers alike in the coming years. The full video of the event can be accessed hereâ€”we encourage you take a look! USDOL has announced another delay for the forthcoming final regulations for the Workforce Innovation and Opportunity Act (WIOA). Significantly, state WIOA plans will now be due April 1 of this year. The final WIOA rules will now be published sometime in â€œJune 2016â€. Moreover, USDOL has also clarified that requirements related to the sharing of One-Stop infrastructure costs will not go into effect until the next program year rather than the one set to begin this summer. More recently, Congress has begun to express disappointment with this announcement. USDE has continued to provide the field with more information about the ongoing implementation of the Every Student Succeeds Act (ESSA). The Department has created a website to house all of these updates and plans to regularly update it the coming years. Early this month USDE formally began the negotiated rulemaking process which is set to begin later this spring. Business-education collaboration is a â€œclassic win-win,â€ says John Colborn, director of the Aspen Instituteâ€™s Skills for Americaâ€™s Future initiative. Employer engagement was one of many critical issues featuredÂ during last week’s NASDCTEc Spring Meeting. Yet, there are ongoing challenges to breaking down decades-old silos, and there are no quick solutions. Challenges include the differences between national and local interests as well as views between the long-term perspectives of educators and the often short-term views of employers; finding the time necessary to nurture strong relationships; and developing a common language to create common understanding among all partners. At Skills for Americaâ€™s Future, Colborn said they are trying to operationalize the idea of effective employer-led partnerships. To do this, the initiative has been evaluating the grantees of the U.S. Department of Laborâ€™s TAACCCT program, which provides community colleges with funds to expand and improve their ability to deliver education and career training programs that prepare workers for high-wage, high-skill occupations. The evaluators have found that grantees did a number of things to build and develop employer partnerships, a key feature of the grant. Activities included curriculum alignment to the needs of employers as well as experiential learning, which Colborn said was critical to ensuring students graduated with the skills necessary to perform at full capacity from their first day on the job. Another collaborative effort highlighted came from the U.S. Chamber of Commerce Foundation. â€œ(The skills gap is) no longer a gathering storm on the horizon,â€ said Jason Tyszko, senior director of policy and programs at the Foundation. With mounting evidence such asÂ the recent Lumina/Gallup poll that showed dramatic differences between the views of chief academic officers and employers about college graduatesâ€™ career readiness, Tyszko said the recent work at the U.S. Chamber Foundation is seeking to close that gap by applying supply chain management strategies to the pipeline of skilled workers. Read more coverage about the Chamberâ€™s â€œManaging the Talent Pipelineâ€ initiative on our Research Review blog series. Since the 2014 release of the Talent Pipeline research, the Chamber has been working to implement some of its recommendations including toolkits about how to better build employer capacity as the end consumer of education. Tyszko said he often gets asked about how education can engage employers better, but he offered that the entire question needed to be turned around to put the employer in the driverâ€™s seat. Among the many ways to do this, Tyszko said this might mean moving away from traditional CTE local advisory boards to working with an intermediary to connect all of the right partners in the conversation. To make employer engagement meaningful, Colborn encouraged institutions to dedicate someone whose entire job is engage employers and to devise strategies to grow this work and further, how to measure it over time. For the second consecutive year, a significant number of states have developed and implemented new policies and programs to advance Career Technical Education (CTE) at the secondary and postsecondary levels. 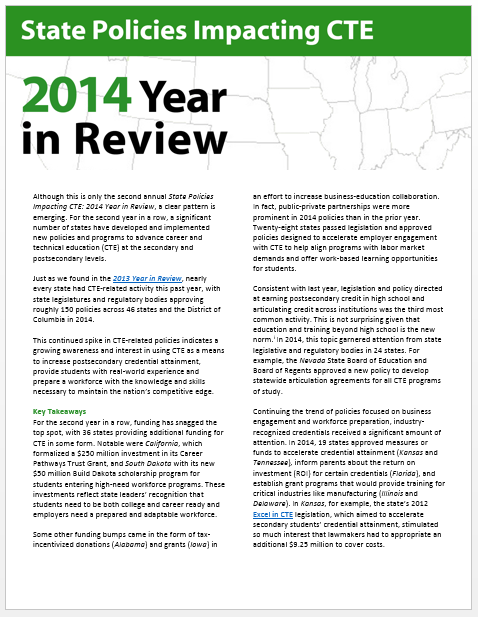 In a new publication, â€œState Policies Impacting CTE: 2014 Year in Review,â€ legislative and regulatory bodies in 46 states and the District of Columbia approved roughly 150 policies relevant to CTE. The paper was jointly authored by NASDCTEc and the Association for Career and Technical Education. 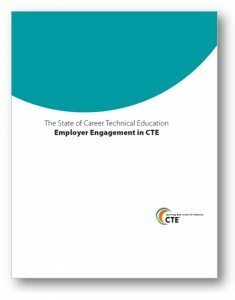 This continued interest shows a growing awareness in using CTE as a means to increase postsecondary credential attainment, provide students with real-world experience and prepare a workforce with the knowledge and skills necessary to maintain the nationâ€™s competitive edge, the paper argues. The paper is the second installment in the â€œYear in Reviewâ€ series. The inaugural paper from 2013 can be viewed here. The legislation and policies collected in these papers does not imply an endorsement by NADSCTEc, ACTE or state CTE leaders. Rather, the hope is that by collecting these policies into one document, NASDCTEc and ACTE can continue to inform the community and in turn lead to the adoption of positive CTE policies across the 50 states. 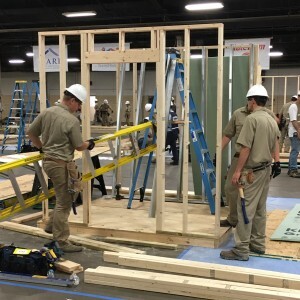 While funding activity grabbed the top spot for the second year in a row, industry partnerships and work-based learning emerged as a newly popular category, with 28 states passing legislation or approving policies designed to accelerate employer engagement with CTE and offer real-work experiences for students. Policymakers maintained their interest related to high school students earning college credit as well as how credit transfers across institutions. States such as Nevada approved a new policy in 2014 to develop statewide articulation agreements for all CTE programs of study to ensure that earned credit in an approved program has total transferability. While several of the policy areas that were active in 2013 were also prominent in 2014, there were a few exceptions, notably governance. Fewer states made changes to CTE governance structures or clarified regulatory authority in 2014 than in the year prior. Thereâ€™s still time to register for NASDCTEcâ€™s upcoming webinars! States are increasingly looking to CTE as a means to help close the skills gap and boost the number of people with a postsecondary credential. Join us as we step through the major state policy trends affecting CTE from 2014 including new laws, executive actions and regulatory activity. This webinar will coincide with the release of the second annual â€œ2014 State CTE Policy Review,â€ a joint publication from ACTE and NASDCTEc. Join us for an in-depth discussion as we take a closer look at how Alabama and Kansas, in concert with their employer partners, work together to inform, align and enhance their CTE systems at the secondary and postsecondary levels. This webinar is the second in a series on employer engagement. To learn more about employer engagement in CTE, check out our newest report! In late October, at NASDCTEcâ€™s annual Fall Meeting, five state and business leaders joined a panel to discuss their reactions to The State of Career Technical Education: Employer Engagement in CTE, a paper to be released accompanied by a free webinar (register now)Â on December 3rd. The following are highlights from the panel. Marie Barry, Director of Career and Technical Education, New Jersey Department of Education, started us off by highlighting ways in which state leaders can use the report once it is released. First, she suggested using it as a reflection tool to answer questions such as: does your state have the right employers at the table? How can your state help in defining what a quality employer and CTE partnership is? She also encouraged states to employee a model of working with schools to ensure states are engaging businesses effectively, while also finding businesses to champion CTE in the state. Lastly, Matthew James, President and CEO, Peninsula Council for Workforce Development, Newport News, Virginia, provided a call to action to states. â€œYour advantage is relevancy; there is a sense of urgency. Entrepreneurs need you.â€ Though CTE has the opportunity to create a workforce ready population, he stated the importance of recognizing the international implications developing career-ready students has on the U.S. â€œBusinesses will leave if you donâ€™t provide a skilled workforce,â€ said James. For more information and resources from the 2014 Fall Meeting, visit the Fall Meeting page.